Technology giant EMC has retained Principal Promotions to stage its annual Momentum Europe conference, planned for Berlin in 2011 for more than 700 delegates. 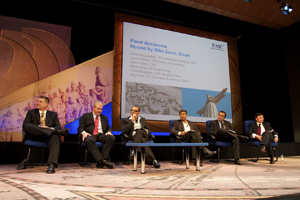 The appointment follows the success of Principal Promotions’ debut contract to stage EMC’s 2010 event. This year’s Momentum Europe was held at the Lisbon Congress Centre from 25-28 October. It attracted more than 1,000 EMC customers and partners from Europe, the Middle East and Africa. Over four days, delegates experienced a series of seminars, networking and social activities in the Portuguese capital. EMC project manager Peta Adamson said: "Principal Promotions did a fantastic job handling the logistics and social programme elements of the event. Director Anupa White was also invaluable in working with our chosen destination management company and plans for next year are now well underway." Provisional dates for Momentum Berlin are 31 October until 3 November at the Maritim Hotel.